I've studied a little about glacial melting and temperature changes in sea currents and worldwide. I couldn't find any definitive answer and since I'm no expert on this matter I'm a bit confused. The southern islands are volcanic islands near the poles, in a permanent frozen state. The continental land shown has normal seasons as in a temperate climate. The volcanoes are active, but they do not give off a huge amount of lava as they are already really high. There will be this enormous eruption on all islands that will change the temperature of the archipelago, thus melting a lot of the ice. The icy water will meet its end at the sea, even some small icebergs will meet the salty water. There are sea currents naturally going from the islands to the mainland. The ice islands are made 50% of land and 50% of ice, having the possibility of dispersing ice bergs and chunks of ice on the sea. Think of the size of the islands as in Japanese archipelago and the distance between them and the continent as the asia mainland distance to it. 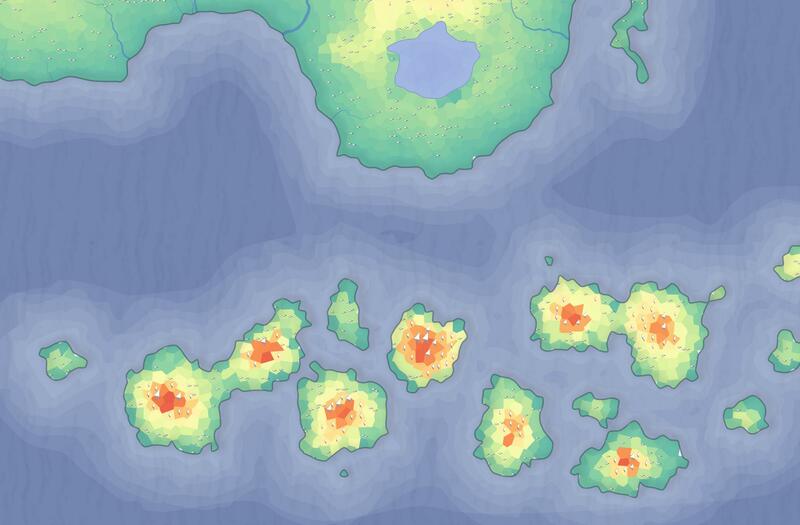 Note that a lot of the setting is being forced a little bit to fit my needs, probably the sea currents and volcanic ice islands near the polar region are not too realistic. I want the outcome of this to be more grounded though, but some tweaks are allowed. Would the result of the setting throw the continent into a harsher winter never seen before? My ultimate goal is to freeze that lake, which is a salt lake and does not freeze over normal winters. Dumping large amounts of cold water into the straits between the archipelago and the mainland will have an effect on the ocean currents. However, the primary cause of a hard winter will be the volcanic ash thrown up into the atmosphere. Volcanic Winters happen whenever a volcano puts sufficiently large amounts of particulates into the high atmosphere. The effect of these particles is to reduce the amount of light that makes it to the surface. Less light means less heat and lower temperatures. Once those particulates drop out of the atmosphere, temperatures rise to normal levels. The entire situation is contrived enough that you can believably say this melting will alter the climate in the short term. Consider the gulf stream, which is a "western boundary current" that carries warm water up the east coast of the United States and out across the Atlantic. One effect of this is the winters in the United Kingdom are much less harsh than they would be otherwise (the UK is roughly 10 degrees further north than Maine). So, you could similarly posit that your mainland is kept more temperate by a warming current and that the temporary disruption of the current would lead to a much harsher winter. I think it was mentioned so I won't harp on it, but the volcanic activity will also have pretty large short term effects on the climate. The main effect will be cooling due to the ejection of ash and particulate into the atmosphere, thus reducing insolation (incoming solar energy). This is probably too in-depth, but since your setting does have tectonics (volcanos), the probable sea-level outcome for the rapid ice melt in the archipelago may not be as straightforward as "the ocean level rises." On Earth, for example, when large ice sheets melt the local effect is actually a perceived lowering of the sea level, while further from the melting activity the sea level goes up more than expected. This is due to self-attraction and loading effects and they have two parts. 1) Ice sheets are heavy. When they are sitting on a land mass (lithosphere) which sits on the compressible mantle, the mass is pushed down into the mantle. When the ice sheets melt, the lithosphere below them rebounds, kind of like if a bunch of people got out of a canoe. So the ocean has gained water from the melted ice (or now-floating ice), but the land mass has also moved upward (=outward). To someone on the shore of this land mass measuring where the water hits a pier or cliff, it would actually seem as if the ocean level had dropped. 2) Ice sheets are heavy. An ice sheet actually exerts some small gravitational attraction on the surrounding ocean, drawing it towards the land mass on which the ice sheet sits. Since gravity works with the inverse square of distance, this attraction drops off quickly moving away from the ice sheet. If we remove the ice sheet (in this case by melting), that attraction is no longer present, and there is a perceived drop in the level of the ocean. Note that this has nothing to do with the ocean gaining or losing mass, but simply that the gravity of the ice sheet caused water to "pile up" near the shore and now that effect is no longer present. These effects are probably imperceptible for a non-technological society, but they tend to be overlooked when we talk about melting ice sheets (we usually say: ice melt -> ocean go up). Not the answer you're looking for? Browse other questions tagged climate weather climate-change ice-age or ask your own question. What would the consequences of a longer glacial period be for modern Earth?